When you need damage from a fire, flooding, or sewage backup repaired and restored, count on 911 RestorationSouthern Illinois to lend you a hand. Disasters both natural and man-made can come in different shapes and sizes in Southern Illinois. Luckily the disaster restoration Southern Illinois professionals from 911 Restoration are fully equipped and trained to give your home a fresh start. Issues like storm damage and flooding are stressful situations to be in. But with 911 Restoration on your side, we’ll make sure that you’ll get through these challenges and your home is restored back to good shape. We are available 24/7/365 day or night to handle any disaster even when they happen unexpectedly. Our team can respond within 45 minutes of your call. With our quick response time and year-round availability, your home will be back in shape in no time. A disaster can leave your home damaged in different ways. Our complete disaster restoration services will make sure that all of the problems that a storm, flood, or fire caused is taken care of. To address flooding and water damage, we will use advanced drying technology that will extract water and moisture from your home. 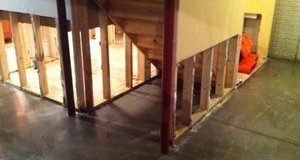 Our team can even work on hard to access areas like the attic, crawlspaces, and space between the walls. Sewage backup is also another disaster that we can assist you with. Our team will be wearing protective hazmat gear and will use industrial strength cleaning solutions to make sure that your home is effectively decontaminated. Aside from these services, you can also expect the 911 Restoration team to assist you in filing your claim with your insurance company to get you the most affordable price. With all the help we can extend, we’re the go-to company for disaster damage restoration! Whether it’s a roof leak, flood, pipe burst, sewage backup, mold growth, or even fire damage, you can count on 911 Restoration’s licensed, insured, and bonded specialists to provide your home with all the necessary repairs and restorations it needs. When you decide to call 911 Restoration, you can expect a quick response and year-round availability. Our IICRC certified technicians will work with only your absolute satisfaction in mind. They can make any disaster affected area of your home look good as new with the quality restorations they can provide. When disaster strikes, 911 Restoration knows how important it is for you and your home a fresh start. Allow our professionals to take care of all the issues that are plaguing your home. If your property is already taking on invading water, then contact our disaster restoration Marion specialists with 911 Restoration Southern Illinois today!